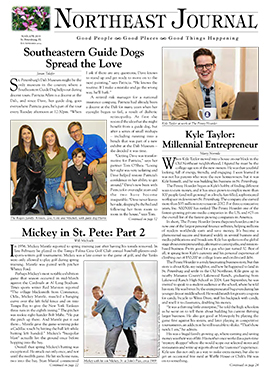 John Collins, executive director of the St. Petersburg Arts Alliance – and one of our neighbors in the Old Northeast – tells me there are over 500 murals in St. Pete. That’s a surprising and impressive number! In the past, most of the murals were downtown. But more recently, they’ve been expanding into the 4th Street North and 9th Street North corridors where they’re adding a cool touch to our part of town. John says that he’s “thrilled to see murals moving out from the central core as businesses see how mural art brings attention to their sites.” He gives the new mural on Pilot Bank as a perfect example. “While not directly advertising, it’s a great way for business and art to work together,” says John. I couldn’t agree more. Every time a business owner commissions a new mural, we’ve made our city even more beautiful. The quality and beauty of the art is inspirational. So, just exactly where are these new murals? Here’s a quick guide to some of the murals that can be spotted on 4th and 9th. A dynamic mural of Ernest Hemingway and Salvador Dali – also painted by Aaron Tullo – graces the side of the Plotnick Law office at 1515 4th Street North. Then, traveling north, it’s hard to miss the mural on Pilot Bank, especially since it’s located at the busy intersection of 4th Street North and 22nd Avenue North. Artists Derek Donnelly and John Gascot created the stunning mural of a biplane flying over the city. The mural absolutely rocks it – quite a testament to St. Pete’s early history. The first commercial flight departed from the downtown waterfront in 1914, with Tony Jannus flying a Benoist airboat from St. Pete to Tampa. Just a bit farther north at 2312 4th Street North is a new mural facing north on the wall of JWags, a popular local hangout. Cecilia did that one, too, in collaboration with the artist DAAS. Their painting of three birds – a cardinal, a blue jay, and a mockingbird is bright, colorful, and stunning. You can’t miss it when you drive by. Cecilia was born and studied art in Argentina, and now lives in St. Pete. She’s painted many of the murals in town, including the large geometric design that covers the intersection of Central Avenue and 5th Street North near Florida CraftArt. Cecilia told me she uses an acrylic water-based product to paint her murals. I asked if she drew the murals first in black-and-white and then colored them in. “No, I create an idea on my computer and then paint it on the building. It’s 90 percent spray paint, with the rest painted by hand.” By the way, Cecilia also painted the new mural on the side of the ONE luxury tower downtown. Jump up to 9th Street North and a mural of enormous, colorful tropical flowers cover the side of the Flower Centre at 2500 9th Street North. 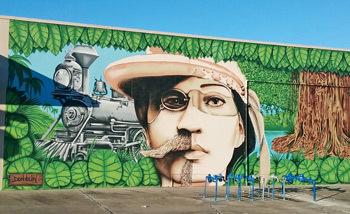 A short distance away, on the side of Cut-Ups hair salon in the 2600 block, mural artist Derek Donnelly has portrayed St. Pete ‘founding father’ Peter Demens, a Russian aristocrat whose Orange Belt Railway opened up this part of Florida to exploration. In an interesting twist, Donnelly transitions the right side of Demens’ face into a Native American woman – an artistic element that he says is an homage to the large Native American population that existed here for thousands of years before present-day history. The title of this piece? Angels and Demons. There is one final mural story, and in my mind, perhaps the most amazing one. It’s the Northeast Water Reclamation treatment plants on 62nd Avenue NE near Canterbury School. Tom Stovall – a local artist known for painting the tarpon at Bob Lee’s Tires on 4th Street North, and the Crescent Lake Water Tower – decided to tackle the job. Because of an issue with worker’s compensation, the city told Tom he couldn’t hire painters to assist him. So this 67-year-old guy who is a former actor and ballet dancer as well as artist, took on the job himself. This was a painting task that should be called the Sistine Chapel of water treatment plants. There are two giant water treatment tanks on the property, a total of some 130,000 square feet – about five football fields in size. Tom says it took 2,000 gallons of paint. Writing this story made me humbled by the gifted artists in our city. St. Pete still has a lot of the small-town, quirky charm that it’s always had, but now I can see that we definitely deserve our new reputation as the Mural City.